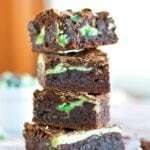 Rich, fudgy, chocolate brownies swirled with tangy, refreshing mint cheesecake! Melt chocolate and butter in a large saucepan*** over low heat. Let cool completely, about 30-45 minutes on the counter or 15-20 minutes in the refrigerator. Once chocolate is cooled, preheat oven to 350 degrees. Grease or line a 9x9 baking dish with foil or parchment paper. Stir sugar into melted chocolate. Add one egg at a time, stirring until smooth between each egg. Stir in vanilla then gently fold in flour and salt. Using a stand mixer or a handheld mixer make mint cheesecake by creaming together cream cheese, sugar, egg yolk, peppermint extract, and food coloring until combined. Stir in by hand the 2/3 cup of mint chocolate chips. Pour ¾ of brownie batter into prepared baking dish. Spread dopples of the cheesecake mixture over brownie batter. Add remaining brownie batter and swirl brownie batter and cheesecake layer with a table knife. Sprinkle with extra mint chocolate chips. *I used chips but semi-sweet bakers chocolate would also work well. ***if possible choose a saucepan capable of fitting all ingredients. If not, transfer chocolate-butter mixture to a large enough bowl after melting.